Ghana’s Football Normalization Committee last Friday had fruitful deliberations with club owners and Chief Executive Officers of Premier and Division One league clubs at the Alisa Hotel. The meeting, very well attended with top football personalities from across the length and breadth of the country, addressed among other things, three key issues namely: participation of Ghanaian clubs in the 2018/19 CAF Inter Club Competitions, cessation of the 2017/18 Ghana Premier League, and restarting domestic football activities in Ghana. It was clear that key constituents in Ghana football are desirous of supporting the Normalization Committee in their quest to reform Ghana football. President of the Normalization Committee, Dr. Kofi Amoah, who chaired the meeting reiterated the need to repackage our local league to rake in monies to strengthen our clubs. He said sponsorship, tickets and merchandising revenues, are the bread and butter of the global football business. Dr. Kofi Amoah also touched on juvenile football, club licensing, infrastructure to develop the Ghana leagues, expressing profound appreciation to the clubs for their high sense of solidarity and camaraderie. The CEO of Heart of Lions, Randy Abbey, aptly described the meeting as cordial, fruitful and positive. The Managing Director of Accra Hearts of Oak, Mark Noonan, bank roller of Kumasi-based King Faisal FC, Alhaji Grunsah, Asante Kotoko’s General Manager, George Amoako, as well as Chief Executive Officers of Meadeama and Ashgold, James Esselfie and Frederick Acheampong, all gave acclaim to the expressed unity of purpose and working with the NC to reform Ghana Football. The NC and the clubs have unanimously agreed that Ghana would not put forward candidates for the 2018/19 CAF Inter Club competitions, and resolved to channel their energies toward the reformation process. Meanwhile, the NC is in the process of designing a special competition to engage the clubs whilst the reforms are in progress. A concensus was reached that the NC would communicate to the clubs when modalities for the special competition are finalised. The finality of the 2017/18 league will be determined by the NC upon further engagements. They pledged to seek clarity from FIFA on club versus player contract row that has arisen as a result of the abrupt cessation of the 2017/18 league. The NC will continue to serve as a platform for information-gathering from major football constituents and the general public in our forward march towards rebranding Ghana football. 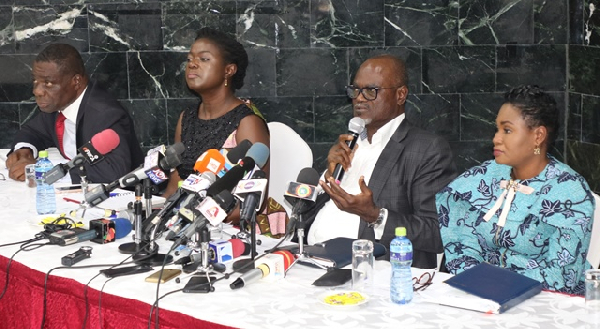 All four members of the NC, president Dr. Kofi Amoah, vice president Lucy Quist, Naa Odofoley Nortey and Kofi Duah Adonteng, were present at the meeting. The president of the Ghana League Clubs Association, Kudjoe Fianoo, and his executives were also in attendance.